Today is my birthday. We had a great day planned starting with coffee and a snack at home, breakfast out at a local restaurant, a trip to the first farmer’s market of the year in our small town, and then a trip to the park so the boys could do an Easter egg hunt. The rest of the day we left open ended but since the sun was going to make an appearance we thought some outdoor yard work and lounging about sounded about right. We did get morning coffee (and I got a beautiful bouquet of flowers) and the breakfast out before heading to urgent care. I will say no more regarding our urgent care, so as to avoid the hay day search engines would have with it, other that to tell you that Carter has Balanitis. Look it up if you wish but it really may fall into the category of too much information for some of you. All you need to know is he is and will be fine. After a lifetime and a half at urgent care we were on our way. Since our health insurance has no providers in our town we were now too far away to get back in time for our local farmer’s market and Easter egg hunt. We improvised. We went to a different farmer’s market where we ate apples, bought some wildflower honey, and the boys got to blow bubbles and use bubble wands. After that we went home and ate ice cream cake for lunch. 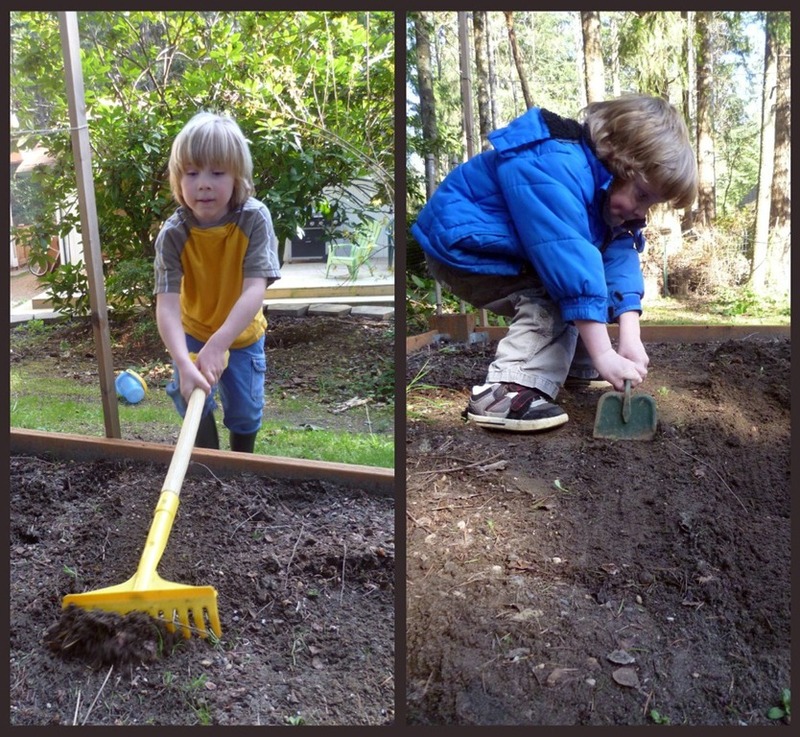 The rest of the day we spend at home where the boys helped me get our garden ready. Oh, and we dyed Easter eggs too. Now it is time to fire up the grill and go sit on the back deck and enjoy the rest of the day. It was not a perfect birthday, but close enough. I will leave you with some pictures of our lazy afternoon. This entry was posted in Little Feet and tagged Children, Easter, Family, Gardening, Happy Birthday to me!, Parenting. Bookmark the permalink. Thanks. 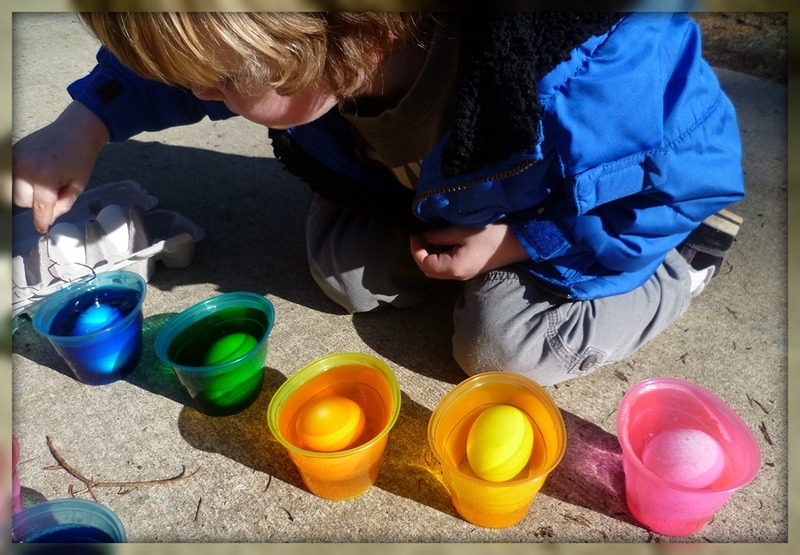 The boys had a great time coloring their eggs and I was happy that it was warm enough to do it outside. Happy birthday! Glad you at least got to have a fun afternoon. Urgent care is no fun. Happy Birthday My Dear Friend!Glad Carter is doing better! Thank you much! Poor Carter has such anxiety about going to the doctor yesterday and then once we got there he was a total ham for the doctor. I am glad he is doing better too, poor kid. poor little guy!!! glad he’s going to be fine…and Happy birthday! Yeah, Carter was pretty unimpressed with the whole thing. Happy belated birthday! Eggs, outdoors, and urgent care. Is there a better recipe for a great birthday? I think not. Birthdays always tend to be full of surprises. Yes they do, sometimes good and sometimes not so good. All in all it was a nice day. I’m sorry it’s taken me so long to get around to wishing you a Happy Belated Birthday! Even though you spent much time in Urgent Care, I hope you found time for yourself. Here’s to many more. No worries. Thanks for the birthday wishes. Even with our urgent care visit it was a pretty good day. Happy belated birthday! Clicking through the link, I realized that we could swap stories on this topic, if it were not such a touchy subject. Urgent care waiting is no fun. The well-raked garden looks ready for seeds.